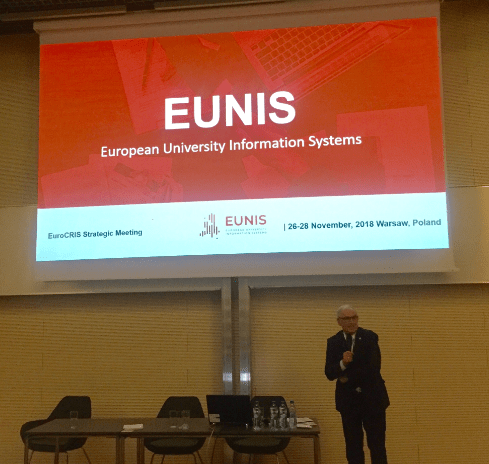 Prof. Tomasz Szmuc, the Vice-President of EUNIS, has represented the organisation at the euroCRIS Strategic Membership Meeting entitled Research Information Management: from an Institutional to a National Level Implementation, held on 26-28 November in Warsaw. The recent OCLC/euroCRIS RIM survey has shown how institutional implementations of research information management strategies tend to be much more dynamic and widespread than national or regional level ones. This is however not a case of either/or: national-level RIM infrastructure does frequently coexist and interoperate with institutional-level one. Using the Polish case study as a starting point, where a national CRIS is currently being built that will need to interoperate with a pre-existing range of institutional systems, this event will look into various approaches to the national vs institutional configuration in Europe and beyond. Save the date: 5 – 7 June 2019 and join us at NTNU in Trondheim, Norway next year! As always, the Congress presents an opportunity for sharing experience amongst international specialists, users, researchers, decision-makers, and teaching staff from all over Europe. The event provides an ideal audience to present and publish the latest results of research, development, and deployment of Information Technology in HEIs. Don’t miss it! You can already visit the EUNIS 2019 Congress website for more information. EUNIS are pleased to invite you to the GDPR and Information Security workshop at Brunel University, London, on Monday 10th and Tuesday 11th December 2018. Audience will be around 50 European CIOs, CISO’s and policy makers. The workshop will, on the first day, provide insights in progress made since GDPR compliance became compulsory in May 2018. Legal, technological and organisational perspectives at institutional, national and international level will be discussed, including vendor and procurement issues. On the second day the focus will be on challenges and practices of Information Security for HEIs. The impact of ever-increasing importance of ensuring security, the organisational and technological challenges and developments will be addressed. Speakers will highlight and share the challenges and solutions found locally, nationally and internationally. Expertise and experience will be shared between universities and national organisations in European countries such as the UK, Germany and Norway and we shall include the perspective of a solution vendor on providing GDPR services and tools. The workshop will be a fantastic opportunity for networking and getting inspiration by sharing good practices and discuss future plans. More information, registration and the programme is available at the event website. We are pleased to invite you to the seventh annual EUNIS BencHEIT benchmarking workshop. This year, the workshop will be held on Tue 27th November at the University of Zurich. On Mon 26th November we will have a pre-workshop day with sightseeing tour and a get-together dinner at the restaurant in the city centre of Zurich. The day is a great opportunity for networking, discussion and sharing experiences between institutions that have been part of IT benchmarking projects. Read more information and register till 12th of November 2018 here. EUNIS and GÉANT have signed a Memorandum of Understanding (MoU) to jointly support the dissemination of standards, IT policies and best practices for the use of information technology in education and research. Dr Raimund Vogl, the President of EUNIS (European University Information Systems) and Erik Huizer, the CEO of GÉANT, signed the Memorandum of Understanding (MoU) during the annual Digital Infrastructures for Research (DI4R) conference in Lisbon. The Memorandum results from synergies in the activities of both organisations, which will continue co-operation on the common goals. The objectives include the dissemination and promotion of high quality infrastructures and services to support the activities of education and research institutions in Europe, as well as contribution to innovation and excellence in information technology for education, research and administration. “I am looking forward to a wealth of joint activities with GÉANT to share best practices and to work together on projects and research for information systems in higher education. Renewing our long-standing cooperation dating back more than a decade with this MoU will be a very positive signal to our respective communities!” – states Raimund Vogl. “The GÉANT community is delighted to extend its collaboration with EUNIS, together continuing to drive forward information technology in higher education, to best support Europe’s students and scientific future”, adds Erik Huizer. Both EUNIS and GÉANT aim to bring together the leadership of research and education institutions, information technology leaders, directors of computing services and of national research and education networks (NRENs), from European universities and other organisations to explore new directions in information technology for education.